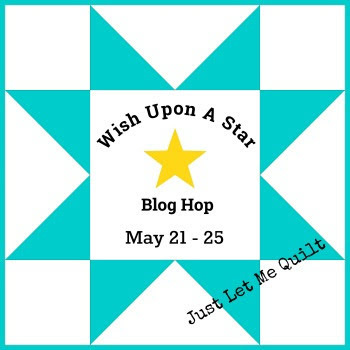 I feel like my wishes all came true this week during the Wish Upon A Star blog hop. I wished for star inspiration and my wish was totally fulfilled. Thanks to everyone who played along or left messages of encouragement! It's my day to share a star project! ten years ago. It was full of stars and had a cute patriotic panel included in it. Perfect for the Wish Upon A Star project. I worked on it during my mini quilt retreat with friends. That's Las Vegas in the background. It was an awesome view! There were so many places to take pictures at this home. Lily was a great quilt model...she's the sweetest dog! Isn't that bell so cool! It was such a fun place to take pictures, plus it felt good to use up fabric in my stash! Just Let Me Quilt - Me! Carol, what a fun patriotic quilt. Obviously it would have stars but it's got so much more!! I'm sure this is going to be displayed real soon for the upcoming red, white and blue holidays. That bell is great but Lily is definitely my favorite part of your photos. Thank you again for this wonderful blog hop which brought me the most traffic ever on my little humble blog. I adore your themes and the resulting camaraderie among us quilters. Keep them coming and I remain a huge fan!! Thank you so much for the blog hop! It was absolutely wonderful and so inspiring. I love your patriotic quilt. Your retreat looks like it was a fun place to sew! I love your quilt! What a great blog hop, thank you!! Lovely patriotic quilt. Thank you for hosting this amazing blog hop! Love it Carol! Couldn't have made anything more fitting. Thanks for the hop! Carol your quit is absolutely stunning! And Lily is the best doggie quilt model ever lol. Thanks so much for bringing us this fantastic hop! This has been one of the best of your blog hops! Everyone shared such fabulous projects, yourself included. I appreciate that you gather all of us together for these! Lily is a great model and that pool looks heavenly - we're supposed to be in the 90s this weekend so that would be so refreshing. It's a beautiful quilt and beautiful photos. Thanks for hosting the quilt along. It's been a lot of fun. Thank you so much for the blog hop. It was amazing. Love your quilt and what a place to take photos. Just stunning. Great Blog Hop. I've enjoyed everyone's star projects. It looks like an amazing place for a quilt retreat. Lovely quilt, Carol--the pattern is really neat, the photo-shoot setting is awesome and the fabrics are perfect. I have enjoyed this hop, just as I enjoy all the others--sew many neat projects. Thanks! Happy Memorial Day weekend and thank you for the lovely quilt inspiration! Love all the colors and placement of blocks. Stars, stars are everywhere. Love your patriotic and starry quilt. 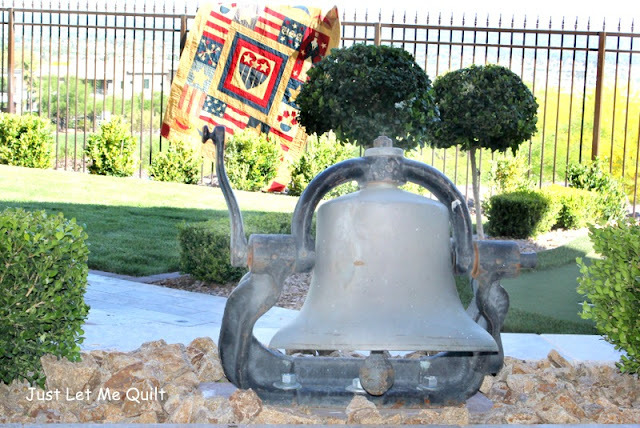 Great photo opps especially with the bell - made me think of the Liberty Bell. Thanks, Carol, for another fun hop. I rather like the simplicity of your hops...has to have a star on it someplace...it allows lots of creativity. That is such a beautiful patriotic quilt! Just in time for the holiday. This has been such a fun blog hop. Loved seeing all the different stars. 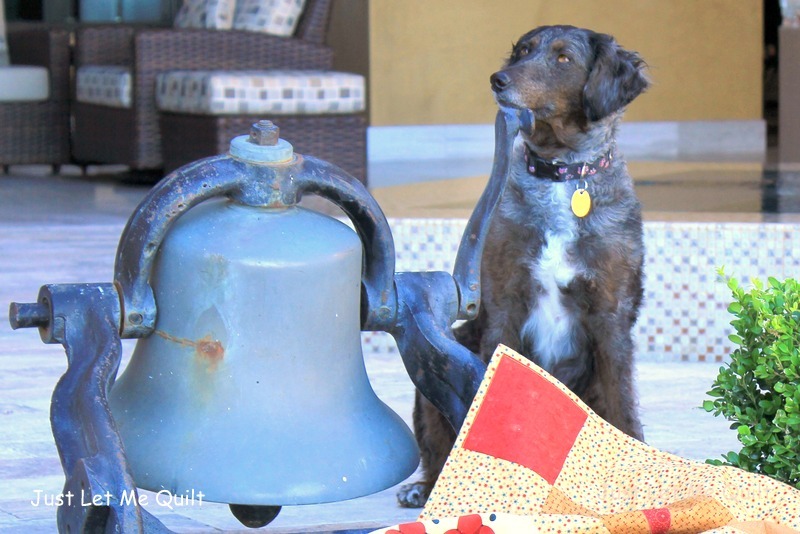 Wonderful photos of this very beautiful quilt, plus Vegas, plus your sweet doggie! My son lives in Vegas and it is beautiful there! Thank you for another wonderful blog hop. Oh my, this quilt is really very nice. I love patriotic quilts, Yay USA! I love this house and yard. I want my own pool! Thank you SO much for the blog hop! It has been inspiring and fun to see stars all week long. And I love your quilt. Very patriotic! wow your quilt is lovely. perfect timing. thanks for sharing these wonderful pictures. Perfect quilt for this Memorial Day weekend and the blog hop too! Lovely photos as always. Enjoy your weekend Carol. Fun quilt, using up stash is always a plus and great pictures. Wins all around! Love your Patriotic quilt featuring hearts, stars and Uncle Sam. What a fun quilt for this weekend and the upcoming patriotic holidays. Thank you for another great hop, my friend. All the inspiration was incredible and I've learned some great tips. I have all kinds of stars in my eyes. Beautiful quilt finished in plenty of time for the 4th of July. You showed me not to discount panels but use them up. Thanks again for hosting a fun hop. Stash busting with a beautiful end! There is hope for all our treasures you say??? LOL! Love this star studded finish. Perfect for our upcoming holidays. What a fun place to retreat and the perfect place for a photo shoot. Thanks for another fabulous hop! Such a pretty finish and the photos are wonderful :) You look like you have the 4th of July covered already!! That's a wonderful quilt, and the pictures are awesome! What a nice looking quilt. It really fits in with the theme and with the holiday. Thank you for a very nice blog hop. I must say, this is a quilt I truly Want! I have to get the pattern for this! So fitting with those colours, and what views out there. A super wonderful blog hop, I have "met" so many new quilty friends, seen amazing stars, and have been inspired over and above anything I imagined. Thanks a heap. 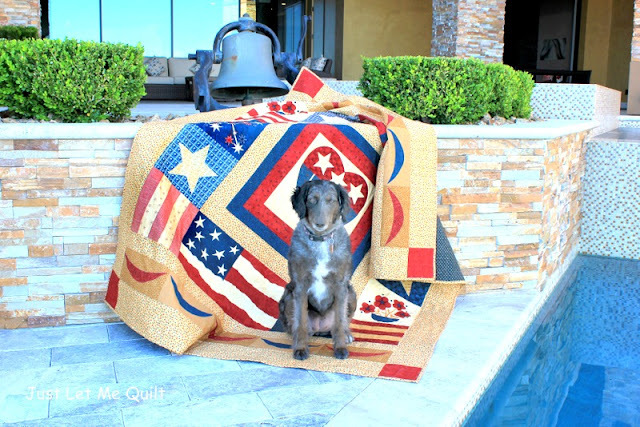 That is a beautiful patriotic quilt and your photo shoot is perfect with the bell and the dog. It was such a fun hop and I so enjoyed seeing all of the fabulous star projects. It was a perfect place to shoot that quilt, outstanding. And Lilly appears to be a camera loving sweet heart. The hop sure served it's purpose in introducing a multitude of stars. A success I would say. Thank you. Looks like you had a great time is an absolutely beautiful location. Who could ask for more when it actually included a dog. Any how, your stash bundle worked up beautifully. A great addition to this wonderful hop, THANKS ! Such a beautiful patriotic quilt. Thanks for hosting this hop. I really love star blocks and it was great fun to see everyone’s blocks and quilts. Wonderful to end the hop with a patriotic quilt! It's perfect, and my favorite pic is the one with the dog and the bell, but second favorite is where I can see the entire quilt at once. Thank you so much for putting this together and the giveaway, too. Stunning quilt, beautiful surroundings! Thanks for hostingyet another successful blog hop, Carol! Your Lily is a darling model! And I haven't seen bottle brush trees in ages--not since I was a little girl, when I didn't have to worry about how messy they were and just thought it was amazing that they looked just like the brushes we used to clean baby bottles. Hmmm, I tried to comment from my phone and it obviously didn't make it! Beautiful stars projects! Nice work putting this together, Carol! Your quilt is so perfect for summer! Well done! What a beautiful view, sounds like you had a great time. And congrats to Rosemary! A lovely quilt and spectacular photo ops! That's a very nice patriotic and starry quilt!